Why would you need stools around the coffee table when you have a big sofa and comfortable armchairs in your living room? Well, actually it’s not that simple. 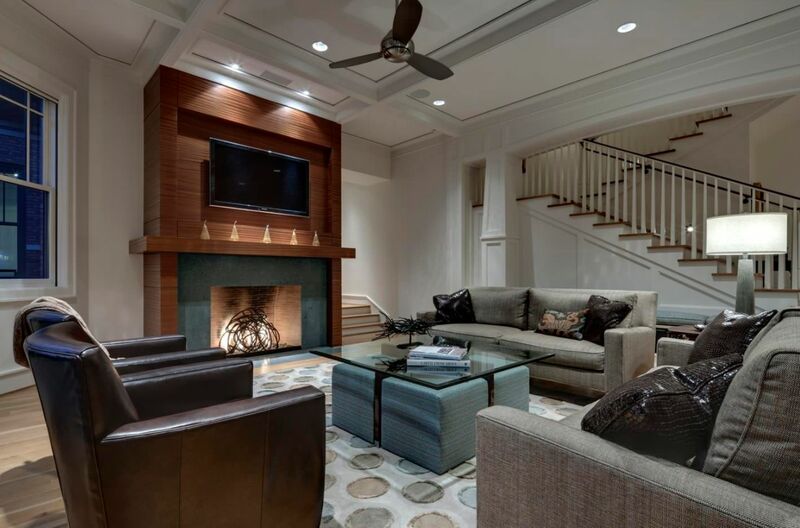 People want to be face to face when they talk to each other and guests find it convenient to just pull out a stool and place it wherever they want in the room, not to mention that you might actually need those extra coffee table stools when large groups are visiting. Just think of them as practical extra seats, great for guests and practical for playing board games around the coffee table. For all these reasons, we find coffee tables with stools to be the perfect combination of versatility, functionality and space-efficiency. There aren’t that many coffee table and stool sets to choose from compared to individual pieces but there are definitely some nice ones to consider. One is the Eastin 5 piece set which includes a coffee table and four upholstered stools. Like all the other sets what we’re about to show you, this one stores the stools under the table when not needed, saving space and maintaining a clutter-free decor. The design is simple, elegant and with a hint of traditional. The beveled glass top is removable. The Jane set is very similar to the one we just showed you. 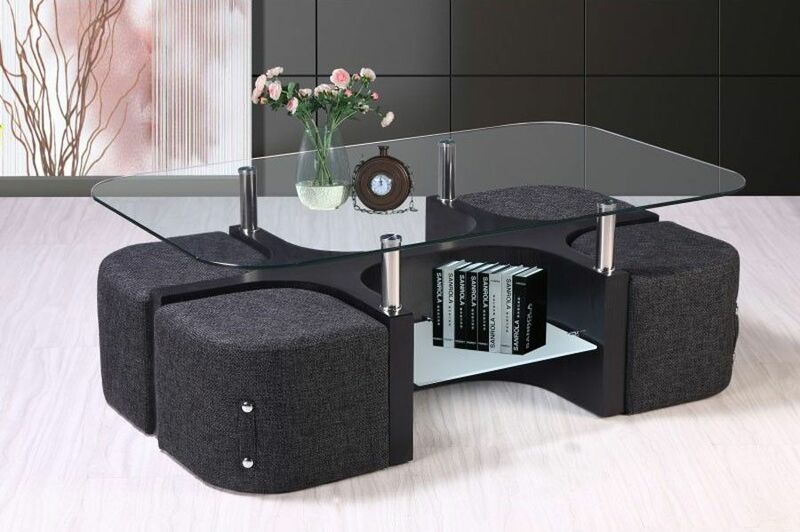 The main difference is in the design of the coffee table which has a solid wood top and no glass inserts. The stools, four in total, are upholstered in dark brown leather and have solid wood bases that can double as shelves, forming storage compartments for each of the guests. A set like this is perfect if you’re the type that likes to have dinner in the living room or to entertain large groups of guests. Let’s change the tone a bit with a coffee table that has a rectangular top. It has its own set of practical little stools that fit neatly underneath. The stools have triangle-shaped seats upholstered in leather and the table has an X-shaped base and a wooden frame complemented by a glass top. The 3219 series table only comes with two stools but you can definitely add more if needed. Right now you’re probably wondering if there are any rectangular coffee table and stool sets that offer four seats instead of the two we just saw. Obviously there are and we’re prepared to show you a few examples, such as the Calla set. This one is ideal for casual entertaining or for large families. It’s comprised of a rectangular-top coffee table and four cube-shaped ottomans that can be neatly tucked underneath the four corners of the table. They’re made of wood and have contemporary designs. 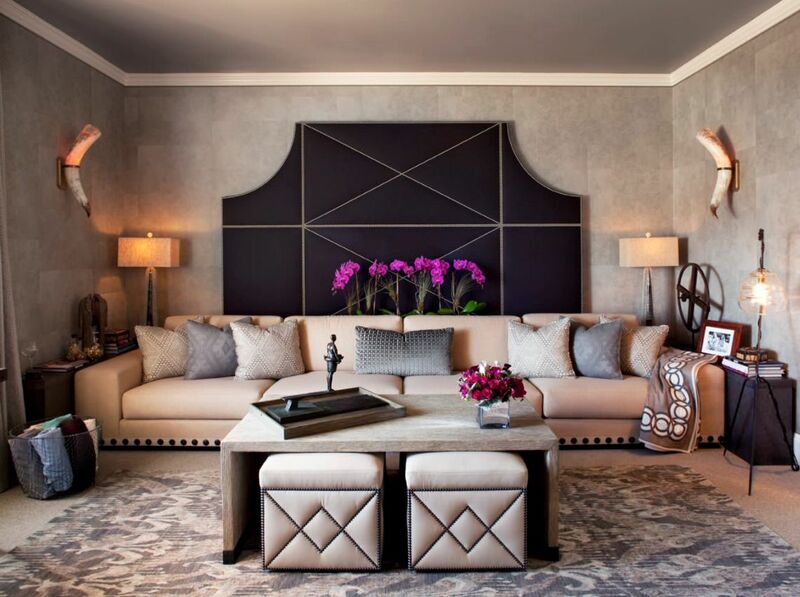 In addition, the ottomans have removable tops which reveal secret storage inside each one of them. We’ve seen a few simple designs, both modern and traditional, so how about something a bit more ornate? We have the perfect set to show you. It’s the Mother of Pearl cocktail table and the four stools that accompany it. 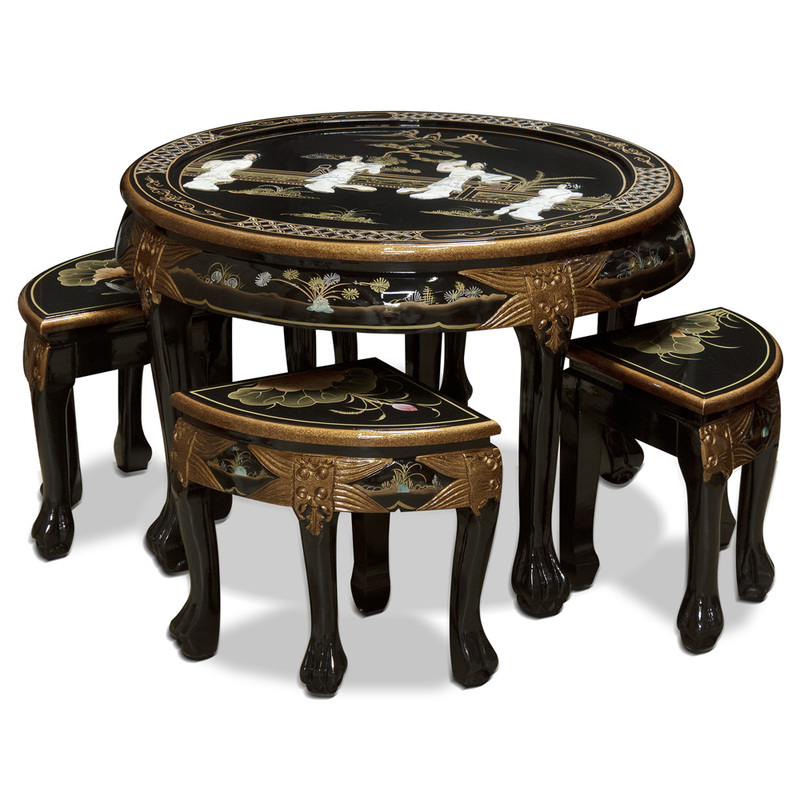 The table has a round top, detailed with hand-painted Chinese maiden figures. 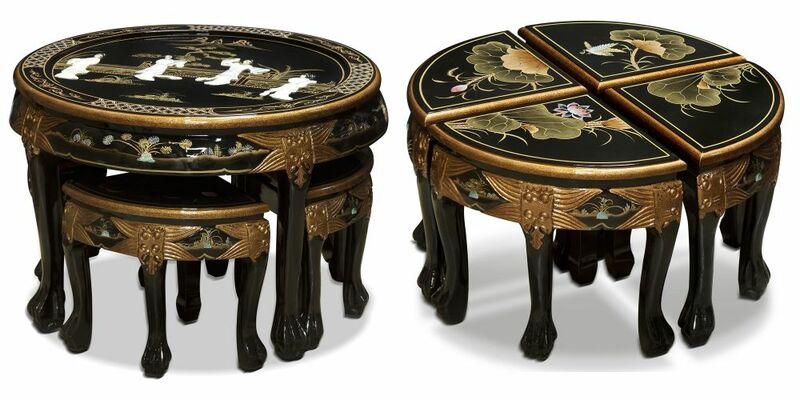 The four stools have matching frames and seats decorated with hand-painted scenery motifs. Let’s get back to more modern designs, since that’s what most of us are interested in. 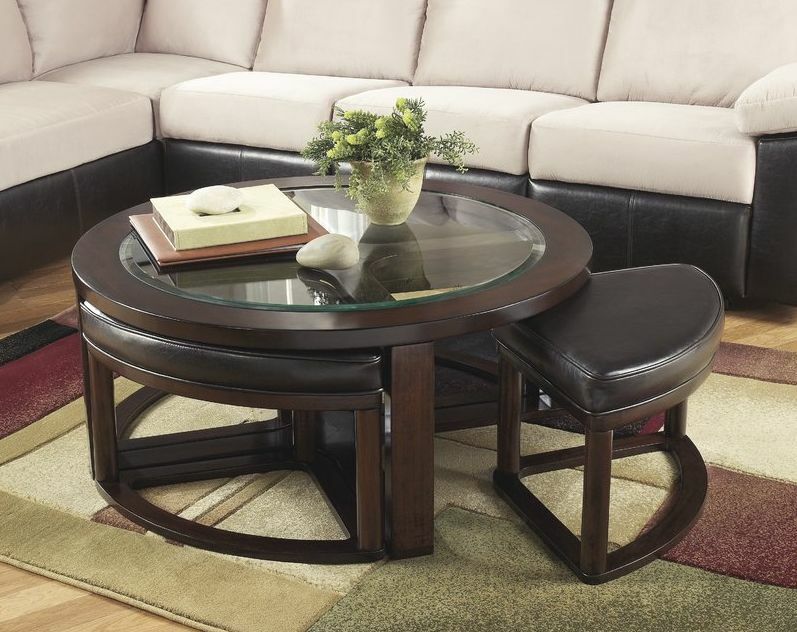 The Hayes coffee table and stool set is just what a modern living room needs. The table features this sculptural, black base with an unusual form that makes perfect sense when the four little ottomans take their place under the clear glass top. There are two shelves, one on each side of the table, which are perfect for displaying and storing things like books, small planters, remote controls, etc. All the coffee table and stool sets we showed you offer more or less the same advantages and only one question remains: how will any of them look like in your living room? That’s obviously up to you to decide. 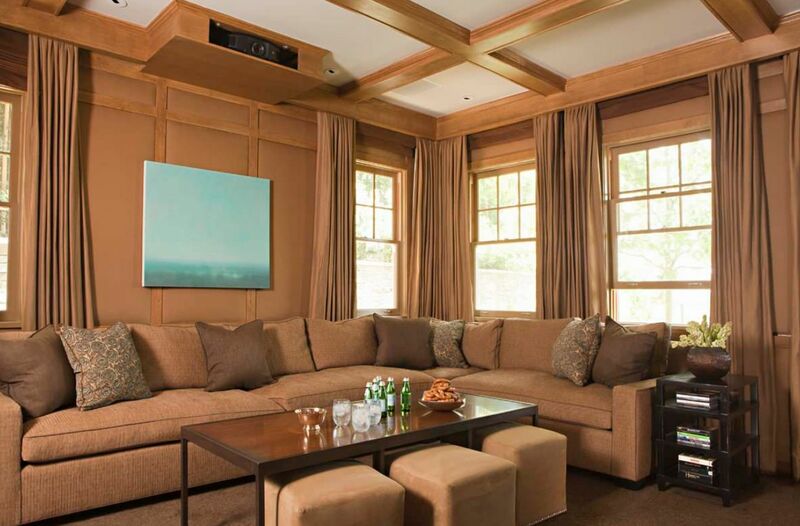 All we can do is offer suggestions and show you how others have integrated similar sets into their own living rooms, like this one for example. What we love about it is the contrast between the thin frame of the coffee table and the full and bulky nature of the stools. Most of the time there’s no need for the extra stools and they can be neatly stored under the table, as shown here. The L-shaped sofa and stylish Eames lounge chair and ottoman are more than enough. It’s important to take into consideration the space that the stools can potentially occupy when they’re actually used. Make sure there’s enough room for them in the living room or otherwise there’s no point in even having them. As you can see, there’s plenty of room for the stools in this living room and the two white sofas keep the decor from becoming too cluttered visually. A bunch of stools or mini ottomans clustered under the coffee table can make a small living room feel even smaller. In that case, look for ways to avoid such an effect. One idea is to opt for a table that has a clear glass top or to somehow match the stools to other elements in the room. 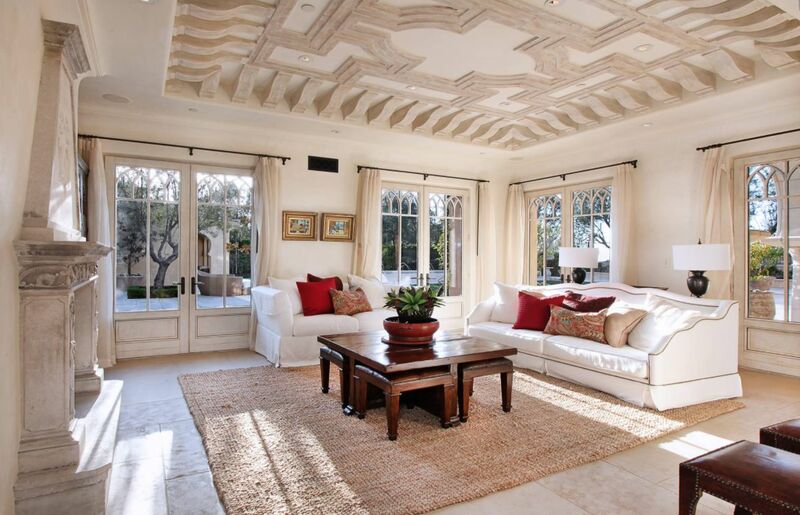 In this particular decor, the ottomans have the same color as the fireplace setting. The whole point in having extra stools under the coffee table is to make your guests feel comfortable so you might as well opt for upholstered stools or ottomans, much like these ones. They’re in sync with the cozy theme of the living room and they complement not only the coffee table but also the sofa and even the headboard-like panel behind it. Most of the sets we showed you come with four stools but that’s obviously not your only option. It’s possible to opt for fewer stools or even for more if needed. Check out this simple coffee table which can fit no less than eight comfortable ottomans under its top. 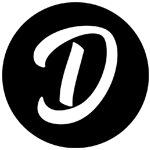 You can have your custom made according to your specific needs. You're reading Coffee Tables And Stool Sets That Guests Are Always Grateful For , originally posted on Homedit. If you enjoyed this post, be sure to follow Homedit on Twitter, Facebook and Pinterest.